We’d love your help. Let us know what’s wrong with this preview of The Blue Moon Narthex by N.J. Donner. To ask other readers questions about The Blue Moon Narthex, please sign up. This book definitely fits into the middle grade area. As someone who reads mostly YA it was nice to take a step back into books similar to Harry Potter, Percy Jackson and the Magisterium. The Blue Moon Narthex had the easy, friendship filled story. There were good things about this book and others I didn't like as much but all in all, if you're looking for a book that will keep you busy, no string attached and with a hint of magic then look no further! Now for the further detail. This is still a This book definitely fits into the middle grade area. As someone who reads mostly YA it was nice to take a step back into books similar to Harry Potter, Percy Jackson and the Magisterium. The Blue Moon Narthex had the easy, friendship filled story. There were good things about this book and others I didn't like as much but all in all, if you're looking for a book that will keep you busy, no string attached and with a hint of magic then look no further! Now for the further detail. This is still a spoiler free review! - I loved the dynamic between the three main characters. The children all got along so well and you can see the momentum between them from the moment they're introduced in the book. -The world building in this is fascinating. I love stories that contain magical elements in the real world because it's like "THIS COULD BE REAL?" -The plot is always moving. It's action packed. There's always something happening and when one thing was resolved, the next conflict was beginning. It kept you intrigued and turning the pages. -The world building. I'm super interested in the Coreseum. I found some descriptions of it easy to imagine and others a little harder but I've got a pretty good image in head of what it's like and SIGN ME UP. -I loved the Bahjani. I really hope there will be more of them! -Reading this book, I couldn't help but imagine how great of a TV show it would be. It was alive in my head as I read the words and it was super enjoyable. -Tropes. Most books contain tropes, obviously but there's two in this book I'm kind of sick of seeing. The first, the chosen one trope. It can be written well and in this case it wasn't terrible. I'm eager to see how the rest of the books go though. Secondly, the old two boys, one girl protagonists. I hate to say it but I got HP vibes from it. -I wasn't entirely sure of the time era of this book. There's mention of war but I'm not sure if it's like in sync with WW1 or WW2 or if it was just a magical war? The book is really good at keeping the plot full of action but I would like to see some additional information about the world. -SO MANY NAMES. I can remember all the main characters but even when minor, side characters are introduced you're thrown their name and I really struggled to remember who was who. They would be mentioned later on and it would take me a while to process who that actually was. The book had so much potential and although I thoroughly enjoyed reading it and will most definitely continue to read the series, I do hope it improves as a whole to really bring it up to that next level. Consider me a member of the KSL. My actual rating: 3.5 stars out of 5. Following the death of his father, 13-year-old Cole inherits his most prized possession, a stone called the Blue Moon Narthex which leads him and his two friends to a school referred to as the Coreseum. As the story progresses, he begins to learn the powers behind the stone, how to wield it, and the secret life his father lived amongst the Karmanic Sovereign Legion (KSL). The mission of the KSL is to fight the evil of the world by sliding to different dimensions through old train cars. The Blue Moon Narthex is definitely geared towards middle grade readers so I try to base my review as that and not so much as the grown adult that I am. There were some Harry Potter like similarities in terms of the characters and the "chosen one" trope that can't be denied, and unfortunately distracts the reader from enjoying the story fully. The main character is 13 years old and comes off as much younger with his actions and dialogue. Though, I did quite enjoy the fresh storyline as I have not read anything else like it. The writing style is clear and direct and easy to follow along with. This book was better than I had expected. The Blue Moon Narthex was like a mix between Harry Potter, The Hunger Games, Divergent and several other action/fantasy/really good books, all with a unique twist of its own. There is so much going on in this book that you can really fly through it. There were times while reading it that I was thinking just one more chapter and then the next thing you know I was flying through the Full Review on my blog! This book was better than I had expected. The Blue Moon Narthex was like a mix between Harry Potter, The Hunger Games, Divergent and several other action/fantasy/really good books, all with a unique twist of its own. There is so much going on in this book that you can really fly through it. There were times while reading it that I was thinking just one more chapter and then the next thing you know I was flying through the pages wanting to know what was going to happen next. I like the concept of the sliding and Coreseum and KSL. At times it was hard to wrap my head around everything that was happening because there was so information. I am looking forward to finding out what is going to happen in the later books. (view spoiler)[A suspicious train accident and an odd stone shaped object that belonged to his father thrust Cole McCarthy and two schoolmates into the middle of this battle to keep dark forces in check. After a dangerous encounter with a strange creature, Cole, along with his two best friends, Britton and Sophie, is transported to a secret society called Coreseum, filled with those that have dedicated their lives to keeping the balance between good and bad karma. To help them do this, they use a Narthex, a stone that allows them to use ‘karmanic power’ to move through time and space to wherever they want and need to go. I had a lot of fun reading this book. Author N.J. Donner does a fantastic job at building this world of Narthex’s, chasers, and karmanic matter. Having it set it the early 1900’s adds an interesting dynamic, and Donner works it well into the story. Something I hope to see in the sequel is more character building for the side characters. I found them to be so interesting and I would love to learn more about them! The Blue Moon Narthex has adventure, friendship, revenge, and hope. I highly recommend it! I really tried to like this book and was gonna give the book 3 stars, but I feel like 3 is too much. I don't really feel this story. I don't care about the characters and feel like I'm not that enthusiastic about this book. So that's why I'm giving 2 stars. A lot of questions and mystery: At the beginning of the story a lot of questions arise. I still feel like not everything is solved, or that the explanations weren't en Got a copy of this book via Netgalley, in exchange for an honest review. A lot of questions and mystery: At the beginning of the story a lot of questions arise. I still feel like not everything is solved, or that the explanations weren't enough. I do believe that all the mystery is a good point about this book. The book is ended with not all the questions answered, which is also strong. Sophie and Britten not going home: I feel like the fact that Sophie and Britten are staying with Cole for a whole year is weird. It's explained as the two of them going to an exclusive Academy. This is not even decided by the parents and these kids are 13. It felt to easy and I kept that in the back of my mind the whole time I was reading this book. No real tension: There was a lack of tension in this book. The so called "climax" was supposed to be exciting, for me, it wasn't. Sophie even says she was "almost killed" at some point and I don't agree on that one. Could't picture everything: The characters lack description and depth. The world-building could have been more detailed. I had a hard time picturing everything. Maybe if the book was 40 pages longer and the characters and world would be described better, I would feel more attracted to the book. Cole is a 13 year-old boy who misses his father, a mysterious figure throughout the book. The story starts with Cole waiting for his dad at the train station, eager to spend the summer days with him. A tragedy occurs when the train doesn't stop and crashes instead. Soon after the tragedy, a whole different side of Cole's late father is unveiled, leading to Cole finding out his father was, in fact, part of an association which fights the evil in the world. I was quite intrigued by the synopsis, the promise of a new exciting world brought me back memories of Harry Potter, which I'm positive was a very big influence on the author to write this story. The trio in The Blue Moon Narthex resembles the Harry Potter trio a lot. Cole is basically the chosen one, special, like his dad, and he is greatly skilled in sliding even though he had never done it before or had any training. Sophie loves books and seeks knowledge, but unlike Hermione, she's not adamant on following rules. Britten is not very bright, loves trouble and adventure. Britten might be the most different one from its counterpart as Ron is not adventurous, although neither has much interest in reading. These clear similarities to Harry Potter, although they did bother me a little, they didn't stop me from enjoying the book. I particularly liked the world building, as the characters are not witches but something else entirely. Coreseum reminded me of Idris in the Shadowhunter world, which I quite liked. The idea of a parallel society existing without our knowledge always intrigued me. However, some things didn't work in my opinion. The trio acted older than 13 year olds would and certainly thought older as well. The three main characters also very one dimensional so it's hard to relate to them on a deeper level. There's still a lot we don't know about the KSL which I think should have been explained in the first installment, such as the true extent of their powers. We know they fight the evil, they slide but what then? Neve once was mentioned any special gear created to fight, only to help them slide and prevent falls. Too many names are mentioned in the first instalment, I couldn't keep up. I only the remember a few which had a bigger impact on Cole's life, I found myself not knowing who half of those characters were and what they did. I think young teenagers would enjoy this more than I did, I couldn't stop myself from comparing it to Harry Potter. I do believe it has a lot of potential, there is room for the development of both the characters and the world. Thank You Concierge Marketing Inc. and NetGalley for giving an eARC for an honest review. This is definitely a book to read. Teens & YA is the perfect audience, but I can only imagine that this book can be for all ages. If you loved Harry Potter or Percy Jackson, you may even love this upcoming new series. I have never loved a book so easily and I can already tell this is going to be one of my top books of the year (and it's only the first month so far!). I really couldn't point anything out that could be improved and I thought hard to find something and point it out. The world building was phenomenal. Learning about Coreseum, the Narthexes, sliding, and more was fascinating. It was almost magical and very easy to imagine. I wanted to dream it, live it, and even see it for my own actual eyes. It was that clear. Learning the information and mythology behind this world also kept me intrigued. 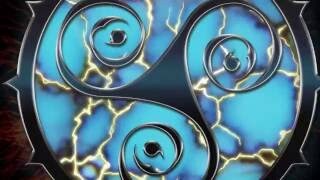 At one point, you learn how the Karmanic Matter was discovered and how it is formed and how it used for the world. Along with that, you get a sense about the history and everything behind the story. The relationship between the main characters was very enjoyable to read through. They all had perfect chemistry with each other and you'll love seeing their adventures and their progress in character as their journey continues. Each character had something to give and that made it enjoyable. As you can see at a lot of other reviews, you can see that Harry Potter being mentioned numerous times; even I mentioned it. I loved the vibes of the series coming from it, but this book showed a lot of similarities between the two and some I can't mention due to spoilers. Most noticeable is the 2 Boys and 1 Girl trio. Although I didn't mind, each character shared many similar characters to the respective other. Also, this book is apparently set during WWI. Although it was mentioned throughout the story, I would have loved it if it mentioned the time period more. I do arguably understand that the majority of the story was set in Coreseum and that it was different from the outer world. It just needed a little bit more mentioning for my opinion. 2 1/2 stars. While this started off with a great story and seemed to have plenty of mystery, it does have its flaws. First, the author is obviously trying to make the main three kids into a Harry Potter like trio (complete with a bookish girl who immediately wants to go to the library!) And the Slider Games Champion being the main kid's dad? Please. Way too much taken from HP. These kids are thirteen... But they act about ten. Kinda bugs me. I've heard it said that "said is dead", but this author 2 1/2 stars. While this started off with a great story and seemed to have plenty of mystery, it does have its flaws. First, the author is obviously trying to make the main three kids into a Harry Potter like trio (complete with a bookish girl who immediately wants to go to the library!) And the Slider Games Champion being the main kid's dad? Please. Way too much taken from HP. These kids are thirteen... But they act about ten. Kinda bugs me. I've heard it said that "said is dead", but this author apparently never heard that saying. Nobody has any type of tone in this book. Something else that bugs me, this is supposedly set around WWI, but the war is only mentioned a few times. Also, they're supposed to be "guided by grandfatherly Norm", but he's only around a handful of times. The synopsis makes it sound like they go off on an adventure, but they're really stuck in an underground compound most of the time. It's supposed to span a year (like HP), but the way it's written makes it feel like weeks instead of months. Bottom line, it's just bad writing. It was boring and it didn't flow right. You didn't get to know the characters in the way you're supposed to when you really enjoy a book. I feel like it's missing a lot. As a middle grade story, it's a very talented work. Each plots like a piece of puzzle put the truth and exciting exploration together. However, maybe it's because that there are lots of mysterious things happen so suddenly, making it need to slow down the paces to unveil all the secrets hidden from Cole's dad. That's the reason why I only give it only 3 stars. Nevertheless, it's still worthy to be patient as getting through the beginning of the book. After passing through those slow-pace plots, everything is being more exciting than I can imagine. This book started out fairly stereotypically, but definitely picked up about a quarter of the way in. By the time I reached the end of The Blue Moon Narthex, it was a solid 4.5 stars. I love it when an author can totally hoodwink you at the end of the story! Middle grade fiction or not, this book will be enjoyed by readers of all ages. This book develops at just the right speed for a work of middle grade fiction (in my opinion). Right when things start getting predictable, the author throws in a wrench, so to speak. This book never got boring! The author's writing is also perfectly aimed at the target age group without excluding older readers from the mix. Donner's style is engaging and easy to read. This book is supposedly set during WWI, but there is practically nothing in this book to make that apparent. The closest we come to "dating" the book is by the mention of a typewriter... If an author is going to bother with setting a book in a particular time period, I feel that some time period details are necessary! (Clothing, name mentions, etc.) Just a thought. I also slightly resent the stereotypical "two boys and a girl" trio. I hate to say it, but JK Rowling sort of used that one up. Frankly, NJ Donner comes scandalously close to duplicating such a trio (ordinary-not-ordinary main character, nerdy girl, happy-go-lucky best friend). There are definitely more character combinations out there! 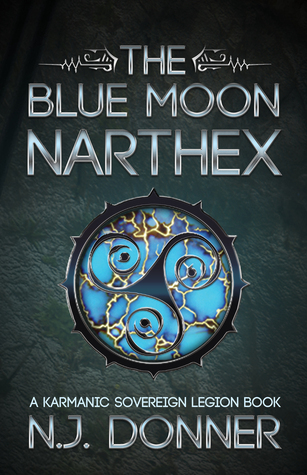 The Blue Moon Narthex was sent to me in a promotional box from the publishers in exchange for an honest review. When I first read the synopsis on the back of the book, I was actually really excited to dive into it. It started out pretty intense with a train crash which lead to the death of the protagonist's father. The problem is that, that was it for a long time. Nothing really exciting happened from now on. Everything was rather slow-paced. The characters that were introduced were rather flat, The Blue Moon Narthex was sent to me in a promotional box from the publishers in exchange for an honest review. When I first read the synopsis on the back of the book, I was actually really excited to dive into it. It started out pretty intense with a train crash which lead to the death of the protagonist's father. The problem is that, that was it for a long time. Nothing really exciting happened from now on. Everything was rather slow-paced. The characters that were introduced were rather flat, so until the end you couldn't really care for them. I was reading patiently to come to some great revelation or betrayal which is so often what is striking about good books but yet again, everything was two-dimensional. Another HUGE problem for me was that, and sorry if I sound kinda stupid, until the end I have NO clue what sliders actually do, what the Coreseum looks like and how you travel to other dimensions with the Narthex!!! Meaning, it lacked thorough description and narration! Finally, I cannot leave out the fact that it dangerously reminded me of Harry Potter... One main protagonist who is an orphan and finds out he is somehow special, two friends, a funny, clumsy, all-eating boy, and a nerdy, knows-it-all girl. An adult friend/mentor who lives in a shabby place with his dog, a giant with a soft heart..... A secret school.... Even though the concept of the book was very original, it didn't rely on its own strenghts but rather blended into other things we've already seen before. I have to review this book as 2 people, the average adult reader and a 4th grade teacher. As an adult reading this story, I have to rate it a 2/5 stars. The story is about a 13 year old boy who learns his father isn't who he thought he was and kept secrets about his life. He discovers these secrets and his role in his father's secret life. The main character, 13 year old Cole, doesn't act like a 13 year old. The way he speaks and carries himself, I kept thinking he was an 8 year old child. The s I have to review this book as 2 people, the average adult reader and a 4th grade teacher. As an adult reading this story, I have to rate it a 2/5 stars. The story is about a 13 year old boy who learns his father isn't who he thought he was and kept secrets about his life. He discovers these secrets and his role in his father's secret life. The main character, 13 year old Cole, doesn't act like a 13 year old. The way he speaks and carries himself, I kept thinking he was an 8 year old child. The same with Cole's friends and supporting characters, Britten and Sophie, their interactions and conversations were very elementary. I was disappointed with the book as a whole. Dialogue between characters felt drawn out and it was difficult to really get into the story. As a 4th grade teacher, I have to rate it a 3/5 stars. I think The Blue Moon Narthex is a good book for my male students to read. The main character is a (on the younger side) 13 year old who has grown up around trains his entire life. His father's secret life leads him on a mission to discover the truth, and he has great friends who go along on this journey with him. There is a lot of dialogue for slower readers to follow along with. At almost any point, the reader can identify the emotions of the characters and descriptions allow the reader to paint a picture of the environment. This is the type of book I could use during my literature circles. I won this in a goodreads giveaway at the beginning of the year and now I finally got around to reading it! I really liked the main character and the idea of the narthex was really cool! Parts of it were a bit cliche, but other than that I really enjoyed it! Not a bad book, but too similar to other "trio fighting the bad guy because the adults won't do it" books. Tropes everywhere. And 13 year olds who aren't acting/speaking their age. That said, for children today who aren't as familiar with Harry Potter or Percy Jackson, there's enough action and magical world-real world interplay to keep them interested. I won this book on a Giveaway and I am so glad I did. I enjoyed each page of it. This book was so special, so magical and filled with suspense. I like the whole idea of the story starting from Narthex ending to Cole's friends. Differently from the other authors I love the idea that the story was in the past. I loved the idea of sliding so cool and freaking cool. I got so addicted to this book can't wait for the second book. If I could make a suggestion that would be to make the book longer becaus I won this book on a Giveaway and I am so glad I did. “The Blue Moon Narthex” is a YA fantasy novel, which reads more like a middle grade fantasy. Cole, a 13-year-old, and his two BFFs, Britten and Sasha, become involved in a world they didn’t know existed after Cole’s father dies. Cole, Britten, and Sasha seem immature and come off as younger than teenagers and this feels very much like it was modeled after the first Harry Potter book with the kids being about the same maturity level. The main comparisons to HP, are the mysterious circumstances, p “The Blue Moon Narthex” is a YA fantasy novel, which reads more like a middle grade fantasy. Cole, a 13-year-old, and his two BFFs, Britten and Sasha, become involved in a world they didn’t know existed after Cole’s father dies. Cole, Britten, and Sasha seem immature and come off as younger than teenagers and this feels very much like it was modeled after the first Harry Potter book with the kids being about the same maturity level. The main comparisons to HP, are the mysterious circumstances, parental secrets, trio of two boys and a girl (with similar personalities), and the introduction to a world of magic. Here, that world is the Karmanic Sovereign Legion. The story begins with the mystery of the relic given to Cole by Norm (whose role is really just to introduce Cole to this new world and where to go- feels quite like Hagrid). Cole begins to investigate and soon is taken to the Coreseum, which felt a lot like Hogwarts (with some slight variations). The kids are divided based on talent and given a role to learn through a new education system. The book felt pretty slow, and a lot of time is given to relatively smaller details/things are slow to develop. On the other hand, this means things are pretty well explained/described as the book progresses, although answers are slow to become clear. Overall, it felt more like it would be targeted to a middle grade audience, and there I think it could do really well for that audience. It has mystery, comradery, and a hint of magic- all full of explanations and without any villains that are too scary or adult themes. It would be good for children who are fans of Harry Potter and the Chronicles of Narnia. For me, as a lover of YA, I found it really hard to get into and it just seemed a little too immature, slow paced, and black-and-white for my taste. I was able to get through it, but kept putting it down frequently. Review to be posted soon! The book features the famous 'two-boys-and-a-bookish-girl' combination of main characters. This was one of the aspects of the book I was disappointed with. The characters seem to lack depth and I could not connect with them. I did not get to know them all that well even after turning the last page, which was a pity because a little more insight into them could have really made the book stand out. A lot of reviewers have noticed the similarities to Harry Potter and seem to be comparing the two, which I think is unfair. The plot is average and the only part that really stood out for me was the Slider Games. I was underwhelmed by the climax. However, the world-building is what won me over. It is refreshingly different, detailed in places and well thought-out. The part about karmic matter Again, I felt like I needed more description for me to really paint a picture in my head, but I loved whatever was on paper. The writing itself was easy to follow and clear, but the length of the chapters was unsatisfactory. I think that if the chapters had been longer with more description and interaction between characters so we could get to know them better, the book would have been more interesting. Readers who enjoyed the high-stakes adventure of the Percy Jackson books will love the fast-paced suspense in The Blue Moon Narthex. I found Cole to be a much more likeable character than Percy, too, which made me enjoy the book quite a bit. Definitely a great pick for adventure readers or fans of books featuring a secret society. I was given this book free in exchange for an honest review and honestly, I was looking for it not to be good. I hate to say that but it's true. However, it really was! I could easily see this featured in a Scholastic catalog. My friend's middle school son, who isn't a reader, picked up my copy, read it a few minutes and said, "it's good before the first chapter even!" There are twists, turns, other worlds, teleportation via train cars, nasty characters in pursuit and a kid who has to grow up on I was given this book free in exchange for an honest review and honestly, I was looking for it not to be good. I hate to say that but it's true. However, it really was! I could easily see this featured in a Scholastic catalog. My friend's middle school son, who isn't a reader, picked up my copy, read it a few minutes and said, "it's good before the first chapter even!" There are twists, turns, other worlds, teleportation via train cars, nasty characters in pursuit and a kid who has to grow up on the spot. After a tragic loss, the main character, Cole, finds that his family members have been living two lives. And, it's in his blood to do the same. Whether he wants to or not, his name and what he holds in his possession make him a target of villains he never even knew existed. He can either give up his token and upset the balance of good and evil, or fight for its balance and maybe lose his life in the process. The Blue Moon Narthex is enjoyable, young adult fiction. NJ Donner takes readers into an alternate dimension where the Karmanic Sovereign Legion (KSL) battles evil by sliding from one strategic situation to another via old train cars. The mystery begins when Cole’s father is apparently killed in a train crash. Following the funeral, the 13-year-old receives a large jewel-like stone called the Blue Moon Narthex. As the story unfolds, he begins to understand its awesome power and the evil forces wh The Blue Moon Narthex is enjoyable, young adult fiction. NJ Donner takes readers into an alternate dimension where the Karmanic Sovereign Legion (KSL) battles evil by sliding from one strategic situation to another via old train cars. The mystery begins when Cole’s father is apparently killed in a train crash. Following the funeral, the 13-year-old receives a large jewel-like stone called the Blue Moon Narthex. As the story unfolds, he begins to understand its awesome power and the evil forces which covet it. Like Harry Potter and the Chronicles of Narnia, Cole has youthful companions that fuel his imagination and participate in some of his adventures. While the story is just beginning by the end of this first book, readers are comforted with knowledge that the KSL series will provide answers and more adventures in books to come. Although I won my Advance Copy of The Blue Moon Narthex in a contest, I really enjoyed this book and look forward to hearing more from Donner after he completes his Christmas runs with Santa and the other reindeer. I actually sat and read this basically in one sitting. I felt the pacing of the book was done well, and I didn't find the book dragging anywhere, which is great for a middle grade/ya novel. I do wish our main trio were a little more flushed out. They give me Potter Trio feels, so I hope we get to know more about them in the next book. All in all, its a great start. I am excited to see where book 2 goes. This one is a hard one for me to rate. On one hand, it was a fun story with some really amusing characters(although I would have liked to see one or two of them a little more, maybe in the next installment. I enjoyed the process of reading this book, and never felt the desire to set it down. On the other hand, there were several little things throughout that bugged me, which is why I lowered my rating to around a 3 in the end. The first thing that didn't work for me was how the main characters responded to explanations or new information. They would have reactions more along the line of "oh that makes sense" and wouldn't question things at all. As someone who lives in an age of some incredible technology, I would have even been questioning everything that was going on, so I can't imagine someone from the early 1900's just blindly accepting whatever was conveniently written on paper and placed before them. That leads me to another thing that I wish was presented a little differently. Maybe it's just me, but the time period did not feel like the early 1900s at all. The only things that really kept bringing me back into that head space were the confusion over words like tech and techie, the refusal to give in to buying an automobile, and the occasional mention of the first world war. Other than when those things came up, I kept forgetting how far in the past this was set, and I would have loved to be more immersed into that time period. There was also a loooot about this story that felt like it was trying to be like Harry Potter. Now, I understand that there is an insane amount of books that exist, and that some themes and story lines and whatnot are going to be repeated, and some things really work (especially in YA fatasy) so they will be repeated more frequently, but I think for me, there were just too many parallels. It only bothered me because on many occasions, it brought me out of the story a little, and my preference is a book that I can remain completely immersed in all the way through. Especially with fantasy. I'm not going to go into detail about what parts of the story line/ which characters I feel this about. People will either notice it when they're reading it, or they won't. I'm already being wayyyy too long winded with my review for this book as it is. I just personally don't want to spend a good chunk of a book accidentally comparing it to another book. But again, that's a personal preference thing. I think a lot of people wouldn't mind or may not even notice most of the things that bugged me. So, why give it three stars when there were obviously several points that didn't work for me? Well the simple answer is because I still really enjoyed this books. I liked going on this little adventure through the pages, and I am invested enough that I will definitely be continuing on with the series when the second book is released. I want to know what kinds of shenanigans these kids are going to get themselves into, and how they're going to get themselves out of them. It was a fun, light, easy read, and I think a lot of people are going to end up really enjoying this book/series. This was probably the worst book I've ever read - and I've read a lot of books, many of which I would classify as utter trash. It started off with the horrendous writing style which had me in tears: I'm not sure whether they were due to how hilariously terrible the writing was, or the pain of having to read it. It was cliché and childish - my ten year old sister could've written better. The writing did get better towards the end of the book, but that isn't really saying much. I could have excuse This was probably the worst book I've ever read - and I've read a lot of books, many of which I would classify as utter trash. It started off with the horrendous writing style which had me in tears: I'm not sure whether they were due to how hilariously terrible the writing was, or the pain of having to read it. It was cliché and childish - my ten year old sister could've written better. The writing did get better towards the end of the book, but that isn't really saying much. I could have excused the writing if the book had anything else going for it. Unfortunately, it had nothing. Nothing at all. I cannot say anything good about this book other than that it has cool cover art. The characters were plastic and felt incredibly false. To give you an example, the author portrays the father of the protagonist almost as a villain within the first two pages, and then spends the rest of the book reiterating how amazing he is. It was this inconsistent throughout and I felt nothing whatsoever for the characters. And then there is the plot. This book was classed as 'YA Fantasy' on the back. If I ever gave it to my ten-year-old sister (which I wouldn't because I don't particularly want to destroy her brain cells with this awful book), I would tell her that it was young for her. Young for a ten-year-old is not what I class as 'YA'. No. That's a Childrens book. And the plot very much fit in with this. Besides from misclassification, the plot itself wasn't that bad. Finally, there are the various idiotic mistakes the author made. This book is supposedly set in 1914 Britain. To name a couple of points that really got on my nerves, the author thinks that 1914 Britain had technology similar to what we have today and that kids called their mothers 'Mom'. I've got to break it to him/her - now-a-days British kids call their parents 'Mum' not 'Mom' (they're British, not American) and back then they would have referred to them as mother. And technology in 1914 Britain was not similar to what we have today - they would not have been able to travel over 50 miles in under half-a-day. They didn't have cars and I can promise you that horse and cart don't move that fast. I received an ARC of this book as a first-reads giveaway. First, I have to get something off my chest: vice and vise are not the same word; neither are palate and palette. The author was very pleased with his editing team, which failed to catch that kind of thing, but more importantly, they failed to point out some serious story flaws that could easily have been corrected, in order to make the book better. For example, the book includes several story clichés that could easily have been avoided. The I received an ARC of this book as a first-reads giveaway. For example, the book includes several story clichés that could easily have been avoided. The most annoying is that the main character is given a really good reason not to trust anyone, in order to get the character to do something remarkably foolhardy and dangerous, all in the name of good of course. Also, he gets motivated by the mysterious death of his father at the start of the book, and gets caught up my a mysterious secret society of good guys who, for no apparent reason, are running around like headless chickens. There is no evidence of serious investigation of either of the Big Bad Villains, one of whom appears to have inside information and a history with the group. That seems like a serious flaw in an organization which has been around for centuries. There is also the Narthex itself, the story's namesake. It's powerful. The one that the main character possesses, inherited from his father, seems to be unique and needs to be studied and preserved. So, why is he repeatedly goaded into revealing its hidden powers and making it available for the bad guys to steal? Because that's the plot cliché in progress. Also, the solution to a mystery shouldn't involve a character the reader has never heard of before, and involve things that the reader didn't know could happen. Again, fixable with good editing. That may sound like I think this is a bad book, but in fact, it's not. There are a number clever ideas, and I like the characterizations in the story. There's an intriguing mystery, and while I didn't like the resolution, the setup was marvelous. The premise of the book and the world are interesting, and it's nice to see a fantasy story taking place at a little-used period of time, around the end of World War I. Steam trains and soldiers coming home from the war are part of the story, and other than a few anachronisms, the author did a good job. Co-ed upper-class boarding schools in 1918...okay we'll let that pass for purposes of the story, but using the term "ethnicity" in a 15th century document was jarring, especially when it was used in the modern sense. Another flawed section is a subplot involving travel through space and time. It seemed to involve a version of a paradox of time travel, and the question of whether killing someone before they do something bad will prevent the something bad from happening. The problem is that what actually came out of that subplot just doesn't work, the way it reads, because it seems to involve both characters going back in time, and killing the bad one chronologically before things happen, but experientially after the person has done them, if that makes sense. In the standard version of the paradox, you invent a time machine, and go back in time and kill Hitler before he starts World War II. Okay, so now what? The paradox says that you have also eliminated the reason why you made the trip back, so did you go back in time to kill him? Instead, Mr. Donner broke this paradox, and it bothers me that I can't tell if he did it deliberately. Here's an analogy to the way it works in the book. Okay, so look at it this way: you've invented a time machine. and Hitler apparently has one, too. Now, go back to January of 1945 and convince Adolf Hitler to travel back to the year 1890 and meet him there. Kill him in 1890. Will that undo World War II? Mr. Donner seems to says yes. Um, no, probably not. Or more correctly, why would it? For both you and Hitler, he's already done what you're trying to prevent. There were many things to like about this book, and a few that I didn't like. The characters were interesting and likable. The story is told from Cole's point of view so we get to know him the best. He is a likable kid with an enormous amount of responsibility placed on him pretty quickly. He accepts his new life in the Karmanic Sovereign Legion pretty easily and although he has lots of questions about the organization he doesn't appear to ever seek out the answers. He does try to find the an There were many things to like about this book, and a few that I didn't like. The characters were interesting and likable. The story is told from Cole's point of view so we get to know him the best. He is a likable kid with an enormous amount of responsibility placed on him pretty quickly. He accepts his new life in the Karmanic Sovereign Legion pretty easily and although he has lots of questions about the organization he doesn't appear to ever seek out the answers. He does try to find the answers to what happened to his parents, but without the help of the organization he is now a part of. Cole's friends Sophie and Britten were also likable, but didn't seem too put out when they were told that they were now part of the organization too and expected to stay and train with Cole. Which was a little weird. But they are both clever and loyal friends who help Cole even when they know he might end up in serious trouble. There are several adult characters that were likable as well, but were not in the story that much. The plot on the whole was interesting, but needs a little work. It supposedly takes place during the first World War and while there are references to the war, the feel of the book was more modern than that. Especially in the way people talked and dressed seemed more modern to me. It is never really explained what the Karmanic Sovereign Legion is or what sliders do exactly. There is some talk about keeping good and evil in balance but not any explanation as to how they do this. There is an interesting scene where we learn how the narthexes are made, this is the stone the sliders use to move from place to place instantly. But we are never given a reason why they do this. There is also a pretty good scene when Cole enters a competition which was exciting and fast pace. The pacing and plot overall were good and kept me interested despite the flaws. NetGalley has it listed for teens and YA, but I would place it more solidly in the middle grades, perhaps the 10-14 year olds. I don't see many young adults finding the book interesting. Overall I liked the book but I'm not sure that I will continue the series. This book reminded me so much of the Percy Jackson series (which is a good thing). I honestly didn't know what to expect going into it and I was a little confused in the beginning. The story grew on me though. The characters were likable and I liked how things progressed. 1. The beginning was a little confusing. There were so many names to remember and I was unable to connect with most of the supporting characters because of this. 2. I kept forgetting about the time period that the book was set in because some of the stuff felt very present day-ish / futuristic . 3. Although I liked this book, there was still something missing that I can't quite put my finger on. 4. It's meant to be a YA novel but I got some middle grade vibes while reading it. It was honestly not really an issue for me but I'm just putting it out there. 1. The story progressed quite nicely and didn't really drag unnecessarily. 2. Britten - He's my favorite character and I loved his sense of humor. 3. The Bahjani - They are so cool! 4. The battle at the end was rather short and I liked that because I honestly don't like reading about battles in too much detail. 5. I loved that the author used his kids' names for the main characters. 1. I bet Sophie is going to find a use for all that neutral matter some day. 2. The Bahjani extend invitations for people to join them if they display patience and goodwill. I have a really strong feeling that they'll be sending one out to Sophie in the future. Britten: What she said. You're stuck with us no matter what. 4. This series would make such a great movie / tv show. I would love to see everything come alive. The novel introduces us to an alternative universe where evil travellers in old train cars and the Karmanic Sovereign Legion are responsible to fight this threat. When Cole’s father dies in a train crash, he doesn’t know that he’s being tossed into a world he didn’t know it existed. When he receives a strange stone called Blue Moon Narthex, Cole travels to the Coreseum with his two companions, Britten and Sash This review was originally published on NetGalley. The novel introduces us to an alternative universe where evil travellers in old train cars and the Karmanic Sovereign Legion are responsible to fight this threat. When Cole’s father dies in a train crash, he doesn’t know that he’s being tossed into a world he didn’t know it existed. When he receives a strange stone called Blue Moon Narthex, Cole travels to the Coreseum with his two companions, Britten and Sasha, where he begins to understand the power of stone and the evil forces that are so kin in having it. The story line is enjoyable and the idea of Karma matter balancing the good and evil in the world was refreshing to read. The writing style is very engaging and easy to follow. Unfortunately I didn’t connect with the story as well as I thought I would as I found a lot of similarities with the Harry Potter and Percy Jackson universes. Though the book takes a different turn after a while, I was disappointed with the lack of details of the period when the story takes place and the overly detailed descriptions like the educational process of the three main characters. This the first book to come along in a fair bit that appears to be offering a whole world of possibilities, with clues and hints t A New Slider? It’s a great, in-depth storyline with lots of twists and turns, well written and fast paced yet leaving time to understand the details, all the while, laying a solid foundation for many, many more exciting adventures, hopefully to follow. It is a good read for all ages. This novel is definitely meant for middle school children. I would probably not recommend this for anyone over the age of 13. That being said, this novel was ridiculously similar to Harry Potter. I'm not even kidding you, it was like a knock-off, meh version of Harry Potter. While the story had some interesting concepts like shifting in time, and the force of Karma, the writing and the characters fell flat. I received this novel as an advanced copy from NetGalley in exchange for an honest review. The first story in the Karmanic Sovereign Legion series. The story is great for teens especially if they enjoy mystery, suspense, and intrigue. I won an advanced reading copy of this book during a Goodreads giveaway. I am under no obligation to leave a review or rating and do so voluntarily. So that others may also enjoy this book, I am paying it forward by donating it to my local library. College adventures took N.J. far from his small Nebraska hometown to the southern hemisphere and the inner city. This was the beginning of his wanderlust and today he loves to travel with his wife, Amanda, and thei N.J. Donner is the author of the new Karmanic Sovereign Legion books. N.J. loves to explore. The world fascinates him and he wants to figure out why and how things work, including Karma.